A special team of crime branch arrested seven persons on Tuesday and claimed to have busted a gang dealing in fake degrees, certificates and marksheets. The police said that the gang was operating for the past five to six years and was busted after a specific tip-off. 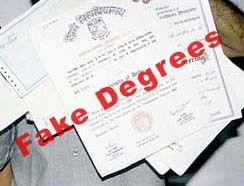 The gang dealt in fake degrees and marksheets of Chhatrapati Shahu Ji Maharaj University, Kanpur; Dr Bhimrao Ambedkar University, Agra; Mahatama Jyotiba Phule Rohilkhand University, Bareilly; besides other educational institutions, degrees, certificates and mark-sheets. These degrees were used to two of the arrested accused are CSJMU employees. Crime branch sleuths said that the gang supplied fake degrees and marksheets of various courses like BA, BSc, BCom, Bed, MA, MSc, BBA, BCA, BTech and MBBS along with UP Board High School and Intermediate marksheets and certificates. “We recovered a good number of degrees, certificates and marksheets and fake voter Identity cards, 34 fake rubber stamps, a lamination machine, scanner, printer, five mobile phones and three computers along with Rs 60,500 in cash and other incriminating documents,” said SSP Yashasvi Yadav. The accused have been identified as Kamlesh Gupta alias Raju, Nitin Agarwal alias Chintu, Shyamji Gupta, Madan Mohan, Ashish Sharma and Chhatrapati Shahu Ji Maharaj university employee Mahesh and Mukesh Jha. Kamlesh, who is pursuing BCom, and Nitin Agrawal were the masterminds. Initially, they prepared fake voter ID cards at their offices in congested Maniram Bagiya under the Pheelkhana police station and Parade. During interrogation, the two allegedly told the cops about Shyamji Gupta, Madan Mohan and Ashish Sharma. The trio along with Mahesh and Mukesh Jha worked as brokers. While Mukesh Jha was employed as the driver of CSJMU registrar, Mahesh worked as a clerk. The accused allegedly told the police that they had sold more than 100 fake degrees and mark-sheets of different universities and colleges to different people. “They revealed that hundreds of persons had procured fake degrees, marksheets and certificates from them to get enrolled in various courses of reputed colleges and institutes. We are looking for the customers of the gang,” said a senior officer of the Crime branch. “They sold these fake certificates for anything between Rs 5,000 and Rs 10,000,” said SSP Yashasvi Yadav further. “Much to our surprise, they could offer any degree, certificate and marksheet,” he added. Police said that they were now looking if any other official or personnel from Chhatrapati Shahu Ji Maharaj University Kanpur, Dr Bhimrao Ambedkar University of Agra, Mahatama Jyotiba Phule Rohilkhand University of Bareilly was involved in the racket.